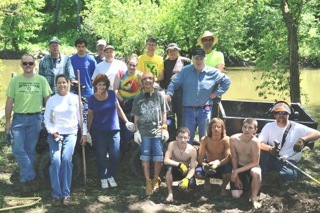 Friends of the Mahoning River cleaned the riverside at the site of the proposed Canoe and Kayak Launch Site in Girard this May. With the help of April May and Dan Janosik and their “toys”, we were able to clean up a large pile of debris that included wood siding, shingles, plastic, and trash. We received assistance from the City of Girard in the form of a large dump truck and driver who hauled the trash away. We loaded the truck four times. Other items removed from the riverside were tires, nylon straps, and numerous articles of trash. Neighbors Tom and Mary Wright and their children helped with the cleanup.